You are here: Home / NEWS / Is West Bengal’s economy actually reviving under Mamata Banerjee? Is West Bengal’s economy actually reviving under Mamata Banerjee? The economic decline of West Bengal is one of the most discussed and debated topics in the Indian public sphere. Pre-Independence, united Bengal was probably the most advanced region of the subcontinent. But 1947 changed that. The partition of Bengal struck the first blow to the region’s economy, killing the massively profitable jute industry – Bengal accounted for half of the global jute production at the time. Suddenly, manufacturers in western Bengal and growers in eastern Bengal found themselves in two separate, sovereign – and hostile – states. In West Bengal, another spell of degeneration came after the Communists stormed to power in 1977. In 1981, West Bengal accounted for 9.8% of the industrial output of India. In less than two decades, that figure fell by half, to 5.1%. In 1986, the Kolkata airport was handling about 10% of India’s import-export volume. In 1999, this had dropped to 4%. Much of the blame for this precipitous decline is laid on labour troubles – the strikes, gheraos and lock-outs encouraged by the Communist Party of India (Marxist) – although a paper by economist Abhijit Banerjee and others points out that there really is no evidence for this hypothesis. Nevertheless, five years after West Bengal voted out the Communists, ending a record 34-year spell, the state might be seeing some signs of economic revival – a fact that ruling Chief Minister Mamata Banerjee made sure to flog before the start of the assembly election on April 4. In 2014-’15, the West Bengal economy grew at a faster rate than the national average, as also did its industrial sector. Over the past three years, per capita income in the state has risen at a smart clip. Long called the sick man of India, even Kolkata appears to have tagged along with the rest of Bengal in the growth. In a report released in 2015, American think tank The Brookings Institution ranked Kolkata second on overall economic performance amongst Indian metros for the year 2013-’14. In GDP per capita growth, Kolkata beat every Indian city, save Chennai. 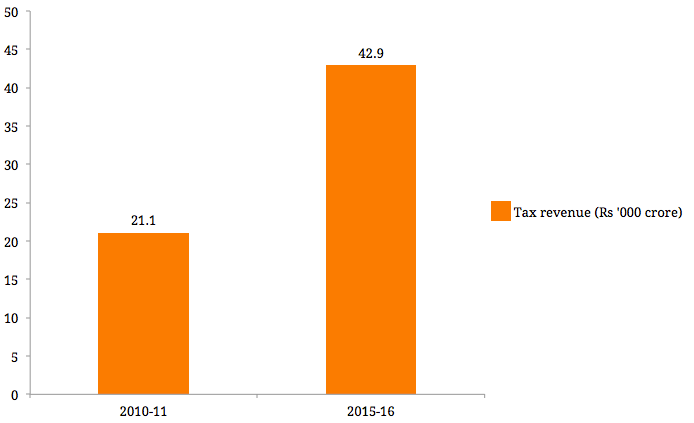 Tax revenue in West Bengal has gone up handsomely, doubling in the past five years. 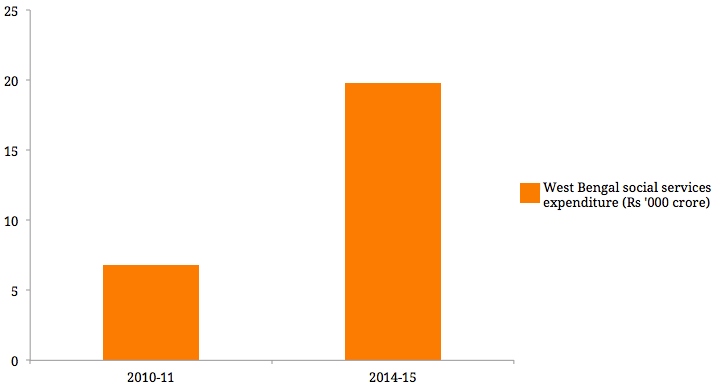 Which in turn has led to increased social sector spending – in the past four years, this has tripled. In the push and pull of public debates, it is often forgotten that economic numbers are only means to achieve human development. Thankfully, West Bengal’s decline on the human development front has not been as steep as its economic decline. 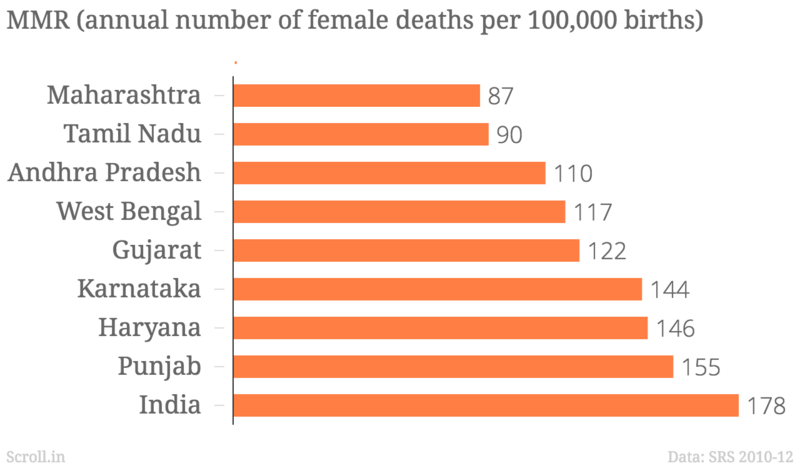 For example, the eastern Indian state does relatively well in preventing infant deaths, which is arguably one of the most basic goals of any government. The state has also done well on another foundational health parameter, reducing the maternal mortality rate by more than 19% from 2009 to 2012. This success has meant that West Bengal beats a number of more industrialised states. 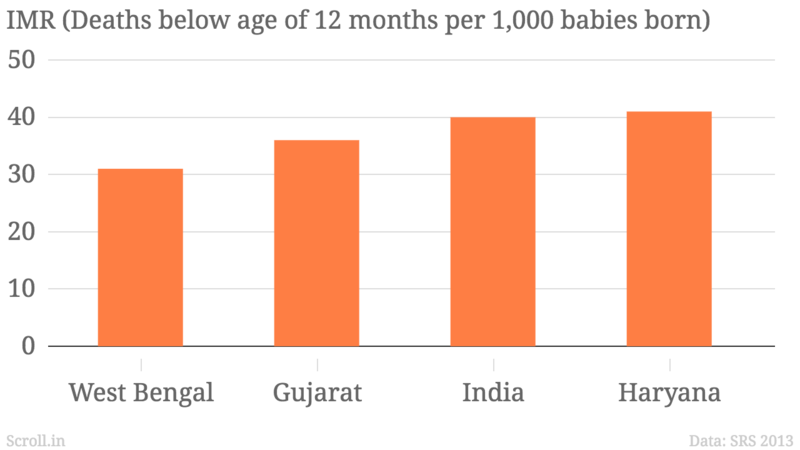 Probably West Bengal’s most impactful and wide-reaching health success has been in reducing the total fertility rate, or the average number of children that would be born per woman. The state has a total fertility rate of 1.6, the lowest in India and approximately the same as Canada’s. Given the hype around the Gujarat model of development, it bears mentioning that West Bengal delivers far better standards of healthcare than Gujarat – although this doesn’t get highlighted in the media as much as news on car manufacturing plants. Somehow, the dominant narrative of development does not seem to include humandevelopment. In fact, West Bengal has notched up another decidedly unsexy development win – it’s the state with the second highest number of villages declared free of open defecation. A fifth of all Indian villages declared free of open defecation are in West Bengal, second only to Himachal Pradesh. Open defecation is one of India’s most stubborn and damaging public health issues, even as neighbours such as Bangladesh have achieved near-total toilet use. How these industrial and human development achievements will help the ruling Trinamool Congress in the assembly election is anyone’s guess. In spite of efforts by Mamata Banerjee to sell a narrative of development – the Trinamool has even used the literal Bengali equivalent of acche din in its ads – the disenchantment of a large number of urban, middle-class Bengalis has meant that West Bengal has been unable to use these successes to effect any sort of rebranding. Add to that the increasingly daunting prospect of a Left-Congress alliance and it looks like Banerjee will have to depend on plain vanilla politics, the sort West Bengal has been used to for decades, rather than any Gujarat-style narrative of development, if she really wants to win back her chief minister’s seat. Dividing Maharashtra: How poor is Vidarbha and how rich is Konkan?